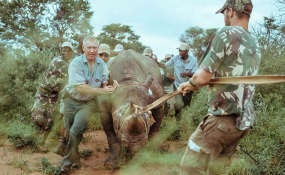 The capture team assists in navigating a rhino. Rwanda officially has the big five game animals following the arrival of 10 rhinos from South Africa Tuesday morning. The rhinos arrived at Kigali International Airport at around 3:30am aboard an Etihad Airways Cargo plane. Other 10 are expected in the country in the next one week. The Eastern black rhinos weigh over on average about 2 tonnes each. The 'beasts' were offloaded under the supervision of a team of veterinary doctors and loaded onto trucks for the last leg of their journey to Akagera National Park. At hand to receive the rhinos were Belise Kariza, the chief tourism officer at Rwanda Development Board (RDB), George Twala South Africa's Ambassador to Rwanda and the manager of Akagera Park Jes Gruner. The development was through a partnership between African Parks, a non-profit organisation that manages national parks on behalf of government, the Rwanda Development Board and funding from Howard G. Buffett Foundation. The last spotting of rhinos in the country was about 10 years ago. In the 1970s estimates put the number of black rhinos in Akagera National Park at about 50 but their numbers declined largely due to poaching. The last sighting of the species was in 2007. In readiness for the rhinos, the park which is a protected savannah habitat has since undergone transformation since African Parks assumed management in 2010. Among the upgrades in readiness for the rhinos includes establishment of an expertly-trained rhino tracking and protection team, a canine anti-poaching unit and the deployment of a helicopter for air surveillance. RDB's chief executive, Clare Akamanzi said that the animals will go a long way in boosting the tourism industry. Wildlife experts say that the return of the species is testimony to the country's progress in conservation efforts. African Parks, chief executive Peter Fearnhead said that despite being a symbol of the continent, the species' existence has been threatened by lucrative and illegal rhino horn trade. Howard G. Buffett, Chairman and CEO of the Howard G. Buffett Foundation termed the development as another milestone in Rwanda's conservation, and eco-tourism. With fewer than 5,000 black rhino remaining, experts estimate that there are only about 1,000 Eastern black rhino remaining. The return of rhinos follows the re-introduction of lions in Akagera National Park in 2015. Park managers say that the population of the big cats has more than doubled with the park having 15 lions currently.